I had asked for the chance to do the feature, but alas, I was too late. Dave Duvall got the honors and did a fine job. I have just a few comments to add to Daves in-depth coverage of the Channel Islands Audio (read Dusty Vawter) mods and the addition of the Monolithic Audio Master Power Supply. What a significant enhancement they contribute to the already wonderful Audio Alchemy DDE v3.0 DAC! Due to the proliferation and popularity of the Audio Alchemy devices, I feel it pertinent that we say even more about this sonically significant upgrade. So many of my friends and acquaintances, myself included, own AA equipment that I was very interested in what kind of changes were wrought by this reasonably priced upgrade. The parts swap (consisting of 2 Burr-Brown Op-amps, 2 Dale Glass resistors, 4 Panasonic HFQ series caps and 8 polystyrene caps) comes in at an astoundingly low $199. The micro controller up-grade for reprogramming the HDCD Dither modes is a paltry $59. There is also available an $89 AD/2 PROM upgrade for reprogramming the DTI Pro 32 for adaptive dither that was not in effect during this head to head comparison. And while the MPS isnt exactly dirt cheap, it is a worthy addition at $399 (everyone seems to be offering it for about $350). 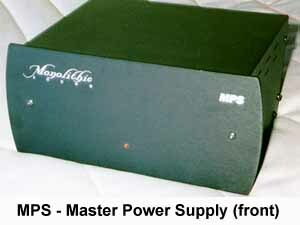 One of my axioms for the past 10 years has been that power supplies are something that cannot be overlooked. They make as much difference as the topology or componentry of any electronic device. As Dave covers the mods to the v3.0 and describes the MPS in his full review, I will not go into that in depth. I had two v3.0s available for comparison, one completely stock and one that sported the modifications by Dusty. Much attention was paid and great detail gone to (thanks to Hal) in order to match levels as nearly as possible for the playback of the two DACs. In preparation for the comparison, each "engine" was fed, via the Audio Alchemy DDS Pro/DTI Pro 32 combo, a 315 Hz test tone (from the Reference Recordings/XLO test disc). Respective output voltages were then measured at the output of the Reference Line Audio Preeminence One A preamplifier for each detented stop on this passive pre-amps volume pot. These voltages were recorded and charted. Left to right output differences measured no more than .2 dBVrms with the modified unit and no more than .02 dBVrms with the stock unit! Once the respective outputs of both units had been charted, a pair of reference settings was selected, one low and one higher, in an effort to match the output from each unit within .5 dB of the other. Actually, the highest difference was about .43 dB at the higher output setting and only .34 dB at the lower volume setting. The system used for the test was the Hal reference room. Hal built his house around his audio room. And you think Im obsessed? The room is 10 high, 16 wide and 25 2" long. The walls are 14" thick. The rear wall (behind the speakers) is treated with Sonex at its center and ASC Tube traps in the corners. The side walls are treated with Sonex and other fiber glass panels as well as large (4 X 8) wall hangings. The rear corners are treated with ASC Tube Traps as well. The speakers used were the Von Schweikert VR-4s connected to a pair of Adcom GFA 5400s in a vertical bi-amp configuration with D.H. Labs Silver Sonic T-14 bi-wires. The Adcoms were connected from the output of the passive pre-amp with D. H. Labs Silver Sonic BL-1s. The two DACs were configured as follows. The Audio Alchemy DDS Pro transport, powered by the DDS power supply, provided the ones and zeros to the Audio Alchemy DTI Pro 32, powered by the MPS, via an Audio Magic Mystic I2S bus. The DTI Pro 32 then fed each of the DDE v3.0s, with the un-modified DAC powered by a stock Audio Alchemy PS 2 and the CIA modded unit powered by the MPS supply. Each v3.0s output was routed to the pre-amp via a set of D. H. Labs BL-1s. At this point I should mention that when introduced to the comparison test, I was initially unaware as to which DAC was which. All I knew was that one was on each end of a source selector toggle switch on the pre-amp. I listened to the first DAC for a while and then replayed the same track with the second. Within ten seconds of making that first "switch" between units I was overwhelmed by a stunning difference in bass control. The second unit offered much better mastery here and a tad bit more extension. Drum impact, from timpani to snare and tom-tom, was more visceral, packing more whollop and slam. The first unit sounded much thicker and slower in that department by comparison, while the second was much faster, more taut and exhibited exhilarating control. My bet was that the first DAC was stock and the second was modded. Hal indicated with a smile that I was correct. Wow, what a difference! If this was that readily apparent, what else was there to hear? Further listening showed the modded unit offered a considerably larger presentation. Staging was deeper, slightly wider and taller. Image specificity was much more focused. Things were better resolved near the back of the stage, revealing more of the space and more detail to queues for size and location. The pace of the music seemed to come through more freely with the modded unit as well. Timing was seemingly much better preserved here. The rhythmic coordination of everything, from full scale orchestra and choral works (Beethovens Glorious Ninth) to Rock N' Roll (Lyle Lovetts Joshua Judges Ruth), was more readily apparent. Things just made you want to tap your foot and sing along more than they had previously. Another delectable change came in the recreation of "space." Instruments not only had a more precise location throughout the soundstage but revealed more of the air around them. Complex passages, such as massed strings and multiple voiced choirs, were unraveled as such with astonishing ease rather than being manifest as one congealed voice. Things sounded more open, displaying more variance between recordings and allowing for distinctions in the recording venues to be more readily apparent. Even set up differences in the studios and halls became more conspicuous. The whole noise floor seemed to drop an order of magnitude. Things emanated from a "quieter" background, giving micro dynamics and low level resolution a very welcomed boost. Little noises in the orchestra, or the audience for that matter, became more easily recognizable. Subtle violin or guitar flourishes were more expressive. Voice inflections, human and instrument, were presented in greater vividness. This change alone justified the entire cost of admission to me, the other improvements being pure bonuses at this point. The integration of frequencies, top to bottom, was handled better. There was more "rightness" to the sounds of nearly every instrument. This was most noticeable to me in the upper registers with things like strings and pianos. The whole top two octaves took on a general warming without loss of detail or distinctness. Most of the overall and annoying "brightness" had been alleviated. There seems to be only one oversight on Daves part in his initial review. Dave states that one cannot use the remote control after the Dither mode 3 micro processor up-grade. That is only true if you do not install the remote 3 wire jumper on the DDE v3.0 between the IR receiver and the PC board. The modded unit I had on hand had this jumper installed and therefore worked flawlessly by remote control. Folks, I gotta tell you this is a significant and worthwhile modification. This isnt one of those, "Well, I kinda like it better" deals. By the end of testing, eight independent sets of ears had all confirmed what I have described here, given varying degrees of relevance based upon each listeners independent listening biases. The performance increase here is, to my mind, so significant for the investment, that I cannot think of any way to spend the $600 differently and achieve a better sonic return. 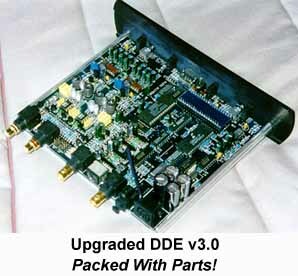 Why discard your "old" DAC when such new life can be breathed into it for so affordable an investment? Dustys mod elevates this already over-achieving upstart DAC to a whole new level of competition. Dusty, my hat is off to you, bud. WAY RECOMMENDED!